Bob Stefanowski signs his acceptance of the cross-endorsement. 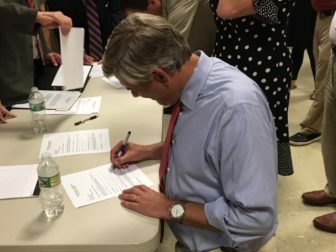 Waterbury — An Independent Party caucus cross-endorsed Republican gubernatorial nominee Bob Stefanowski and the rest of the GOP candidates for statewide constitutional offices Sunday night, voting for the second time in four years to give the top of the Republican ticket a second line on the ballot in November. Stefanowski had the advantage of being nominated by Larry De Pillo, one of the party’s founders, in a competition with four others: Oz Griebel, a former Republican; Rod Hanscomb, a Libertarian; Mark Lauretti, a Republican; and Mark Stewart, a Democrat. Griebel, Hanscomb and Stewart also are petitioning for a place on the ballot. Lauretti, who failed to qualify for the GOP primary at the party’s state convention, is not. The cross-endorsement was ironic: Stefanowski won the Republican primary by bypassing the GOP’s convention. “I would argue I took an independent approach,” Stefanowski told the caucus. Stefanowski won 43 of of the 64 votes cast at the Franco-American Social Club. The GOP nominee for lieutenant governor, Joe Markley, automatically is cross-endorsed as voters in November cast one vote for a gubernatorial ticket. Also cross-endorsed Sunday were the other members of the Republicans statewide ticket, Susan Chapman for secretary of the state, Susan Hatfield for attorney general, Thad Gray for treasurer, and Kurt Miller for comptroller. Manny Santos, the Republican nominee for 5th Congressional District, also was cross-endorsed. 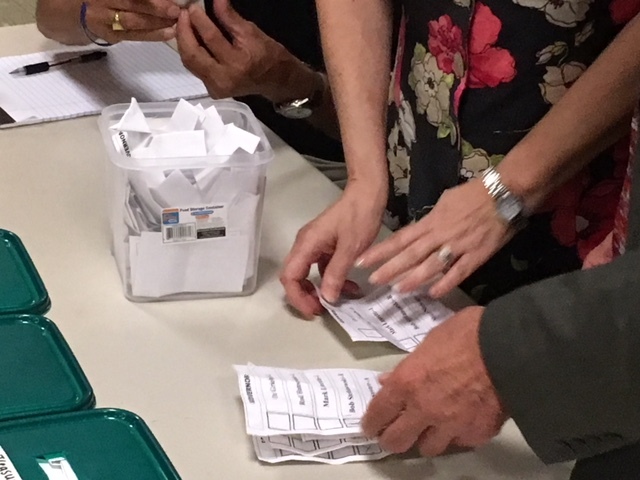 Votes cast by paper ballot. A Superior Court judged ruled last week the Waterbury faction of the party had rightful control over the statewide ballot line, not a faction based in Danbury. The Danbury faction intends to appeal and could yet block anyone from appearing on the Independent line without consent of both factions, said Matt Grimes the lawyer for Danbury. The decision by Judge Trial Referee A. Susan Peck came as the Waterbury faction prepared to nominate candidates. Waterbury and Danbury factions of the Independent Party have been fighting in court for two years over which group controls the ballot line. The inability of the factions to agree left the line unclaimed in the U.S. Senate race two years ago, as Danbury cross-endorsed Republican Dan Carter and Waterbury nominated John R. Price of Wallingford. In her decision, Peck rejected the Danbury group’s request for an injunction blocking Waterbury from nominating candidates for statewide office and concluded that Michael Telesca and Rocco Frank Jr., the Waterbury leaders, had properly filed bylaws in 2010 that establish its faction as a statewide party. The Independent Party cross-endorsed Republican Tom Foley in 2014, but nominated its own candidate, Thomas Marsh, in 2010 when Gov. Dannel P. Malloy won by fewer than 5,000 votes in the closest Connecticut gubernatorial race in 56 years. Malloy was cross-endorsed by the Working Families Party, as is the Democratic nominee this year, Ned Lamont.